One of the predominant themes of childhood consumerism (and of this blog) is "hopeful expectation vs. painful reality." So for a change, I thought I'd focus on a place that consistently managed to surpass my youthful hopes... Rock City Gardens in Chattanooga, Tennessee. 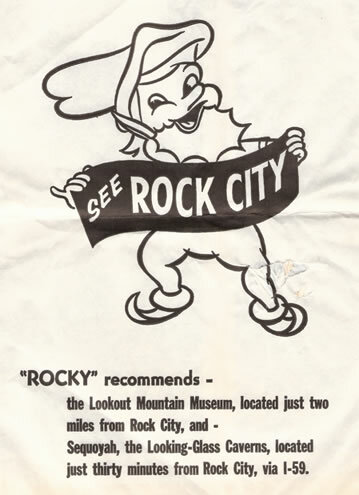 If you've traveled on highways that lead anyplace near Chattanooga you have seen a multitude of roadside advertisements urging you to "See Rock City." 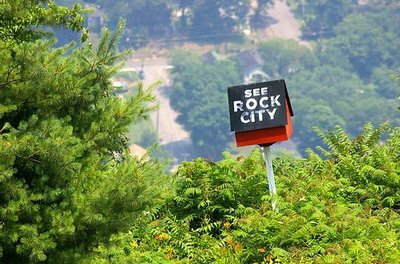 Rock City is in that family of American attractions that are akin to using extreme repetition to wear down, and lure in interstate travelers. (Other examples are Wall Drug, South of the Border, and Stuckey's.) Not only is this advertising technique effective, I consider the gauntlet of billboards to be a considerable part of the Rock City experience. 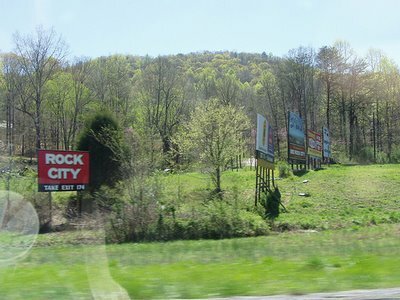 After being subject to so many ads, passing by the Rock City exit can be downright painful. However, if you know Rock City to be your destination then the billboards can gradually ramp up your car's collective anticipation until the thought of arrival becomes all-consuming, and the level of excitement is almost agonizing. You can become so dependent upon seeing the next sign, that you start to feel as though you're being toyed with. A maddening twenty mile dry spell can suddenly erupt into a feast of four-in-a-row signs causing your brain to swell with pleasure-inducing dopamine. The pleas to "See Rock City" come in several unique forms. Most notable are the old wooden barns that are painted up as billboards. 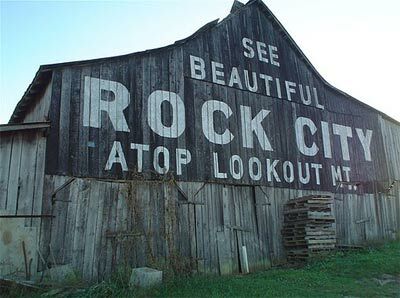 Long ago, a Rock City rep named Clark Byers traveled surrounding areas offering free paint jobs to any farmer who didn't mind proclaiming Rock City's marketing message. In the spirit of these barns, I once painted my own shed with the Rock City advert (see below). Bird houses are another unconventional method of promoting the attraction. Most common are the standard billboards. Prior to the 1990s the volume of these signs was far greater. I remember counting well over a hundred between Little Rock and Chattanooga. I must admit that I liked the ads better when they featured Rocky the gnome. 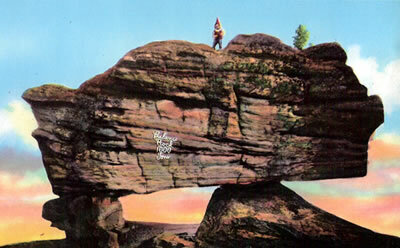 Although I understand that Rock City's efforts to change with the times is one of the reasons it is still around. The climax of the journey to the city of rock is the ascent up Lookout Mountain. The road is twisty, steep, and beautiful. And the streets are named after fictional characters like Peter Pan and Red Riding Hood. The magic kicks in well before you even see the Rock City parking lot. 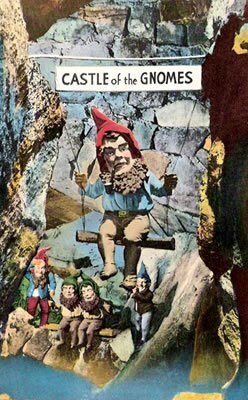 The experience culminates at the Fairyland Caverns, a man-made "cave" full of blacklight-sensitive 3-D dioramas of popular nursery rhymes. I remember my folks commenting that something so artificial was out of place and anticlimactic in relation to the natural wonders. But when I was little it was the perfect topper to an already amazing experience. The miraculous penny in a bottle. 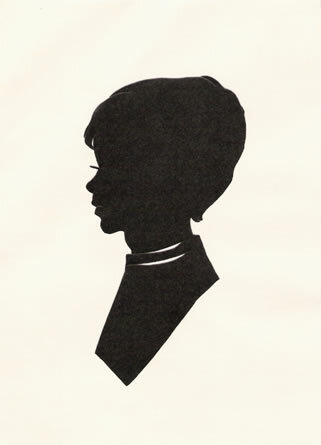 In the midst of the self-guided tour there is a booth where you can sit while a lady cuts out a custom silhouette profile from black construction paper. This was supposed to be me in 1977. Rocky adorns the sack that contains your precious new souvenirs. But don't let him boss you around regarding your next stop. It's your vacation. 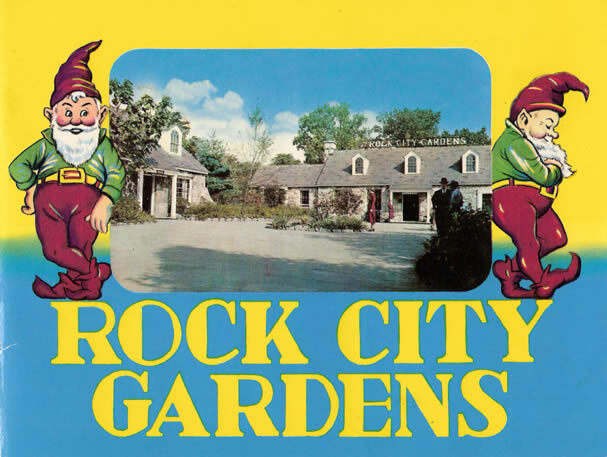 By now, you might suspect that I'm some sort of Rock City shill, but really I'm just a long-time patron who's happy that such a place exists and thankful that it has withstood the post-Disney tourism slump and continues to thrive. So please, by all means... See Rock City. 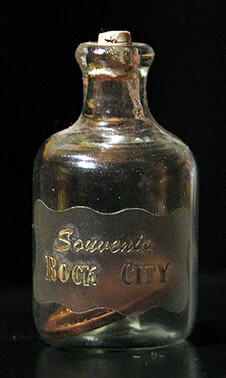 For more information visit the official Rock City web site. I'm amazed to see this entry, Kirk- because I had just done a search earlier this week about Rock City & Fairyland Caverns. I visited both when I was six, during a move from Atlanta to Tulsa. 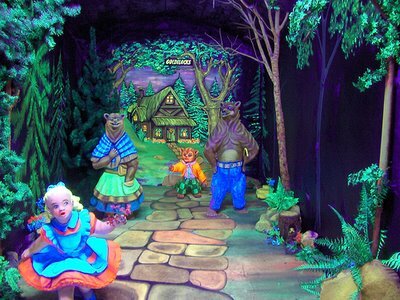 I have only vague, creepy memories of the black-light displays, but I clearly remember walking through the "fat-man's squeeze". We also hit Stone Mountain, during the time they were carving the Robert E Lee image on the side. The were good times! and I loved the entry! That's awesome Travis, I love it when stuff like that happens! I finally got to visit Stone Mountain three years ago. 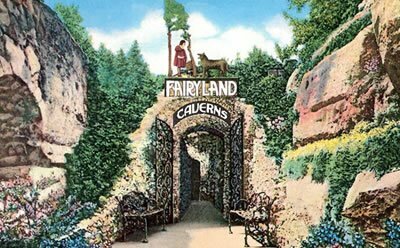 "I once painted my own shed with the Rock City advert.."
Gentle- I will always love fairyland. There's tons of images available if you run a search on flickr.com. Did you get your Monsters Crash DVD yet? I have yet to make it to Rock City. It almost seems like it's in another dimension and not in ours. Your blog is really cool. I love this stuff! Love this. 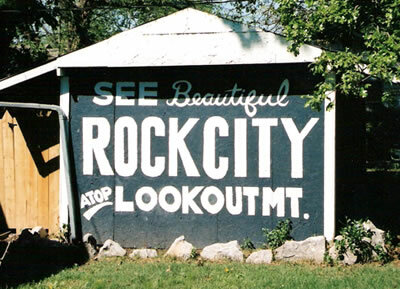 I used to see all of the signs for Rock City when my family would take road trips to see my grandparents in Tennessee. Unfortunately I never got to visit. 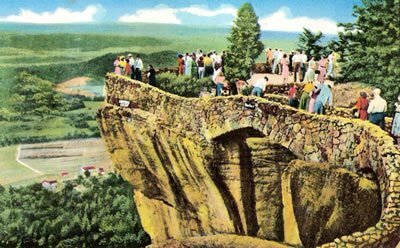 Now I'm extremely curious about Rock City's appearance in American Gods. Wow, a sacred point, that's awesome. I must investigate! i'll be. i didn't know rock city was that famous. i've seen the signs a few times - but always thought it was a bunch of hooey. now i feel like i've already been. they should post billboards of that penny in a bottle, that might convince me to go. i went to Mentone which HAS to be close to Rock City. After seeing yourp ics...I feel like I've been. how nice! and i don't even have to sit in the car for the disappointing drive back home! Thanks Sarah. I think that 'penny in the bottle' billboard idea is worth a letter to their marketing department. Thanks for your great piece on Rock City. It is one of my all-time favourite places because it is the focus of so many great childhood memories. For as far back as I can remember, my family used to go there at least once every few years. As an adult I continue that tradition and plan another trip there as soon as the weather cools a bit. I will no doubt force myself across the "swing-a-long" bridge even each time I swear it's my last! Oh man, the bumper sticker scheme! I'd forgotten, but yes, now I remember arguing with my folks to leave the visor up! What a wonderful "lost" detail. Thanks for the memory. I echo the Gaiman recommendation. Also, you should totally visit the Corn Palace. It kind of ties in with some of your stuff. Great blog! Makes sense that your sillouette is looking to the left...sybolically towards the past...and you like nostalgia.